Sligo Rovers got a much-needed first victory of the season in a first North West derby of the season that was evenly contested, but will hardly be remembered as a classic. In the end, Sligo just about deserved the win. Their second goal just three minutes into the second half from a glancing Kris Twardek header was to prove key. 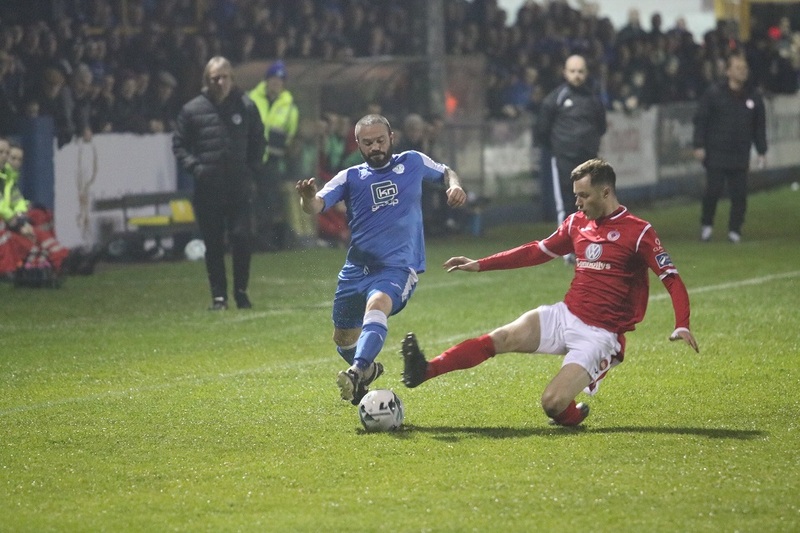 It left Harps with a mountain to climb in the second half and while they did hit back within six minutes through Daniel O’Reilly, they didn’t do enough to muster a second. After decent results against Dundalk and St. Pat’s, Harps supporters in the big derby crowd would have been quietly confident going into this game - a match that was delayed by five minutes because of traffic delays on the way into Ballybofey. But after two big games last weekend, Harps did look a bit lethargic at times. That said they their attitude and effort couldn’t be faulted, especially in the final quarter of the game. Sligo will be delighted with the win. They carried the greater threat over the 90 minutes and in debutante Ronan Murray they had a player who really caught the eye. Despite the result, it was a disappointing night for Sligo’s Ed McGinty who picked up an injury in the pre-match warm-up and was unable to play. The Ballyshannon-based keeper was replaced in goal by former Chelsea netminder Mitchell Beeney. There was no place either for Johnny Dunleavy due to injury, and another Donegal man, Kyle Callan-McFadden’s evening ended very prematurely when a hamstring problem forced his departure on 24 minutes. Harps were forced to field without a key man too with Sam Todd out because of injury.. Harps reshuffled their pack and recent signing Mark Russell came in for his debut, the Scot starting in a wide left role. He started well and almost got on the end of an inviting delivery Mark Coyle during one of several good passages of play from the home side. But in a cagey opening there were few clear-cut openings with Sligo’s Liam Kerrigan racing in from the left but his rising shot was always going over. The visitors however, should have been in front on 19 minutes. Former Dundalk player Ronan Murray whipped in a lovely free-kick which picked out the unmarked Romeo Parkes in front of goal but the Sligo frontman completely mistimed his header and the ball drifted harmlessly wide. It was an early warning for Ollie Horgan’s side and at the second time of asking ten minutes later, Parkes did find manage to find the net. The striker raced clear onto a through ball and after getting to the ball just ahead of the outrushing Peter Burke, Parkes stroked the ball into the empty net. Harps did lift their game between then and half-time and the loss of Callan-McFadden to injury did seem to unsettle the visitors. But despite some late first half pressure, Parkes’ goal separated the sides at the break. They doubled their advantage just three minutes into the new half. Peter Burke had produced a brilliant one-handed stop to prevent Murray from scoring. But from the resultant corner, Jack Keaney’s set-piece was glanced home by Kris Twardek. At that stage, Harps looked a beaten docket but six minutes later, they got right back into the game when Daniel O’Reilly pounced for his first Harps goal. Caolan McAleer, on as a substitute for Russell, was involved in a quickly taken corner which ended with O’Reilly ghosting in at the back post to power his header home. Harps introduced Mikey Place and then Niall McGinley as they went in search of the equaliser. But it was Sligo who had the better chances late on with Parkes and Dante Leverock both going close. Those missed opportunities mattered little however, as Sligo held on for the win. Finn Harps: Peter Burke, John Kavanagh, Daniel O’Reilly, Jacob Borg, Keith Cowan, Gareth Harkin, Mark Coyl (Niall McGinley 82), Raf Cretaro, Nathan Boyle, Sean Boyd (Mikey Place 78) Mark Russell (Caolan McAleer 53). Sligo Rovers: Mitchell Beeney, Niall Morohan, Lewis Banks, Dante Leverock, John Mahon, Kyle Callan-McFadden (Sam Warde 24), Liam Kerrigan, Jack Keaney (David Crawley 86), Ronan Murray (Daryl Forsyth 90), Romeo Parkes, Kris Twardek.